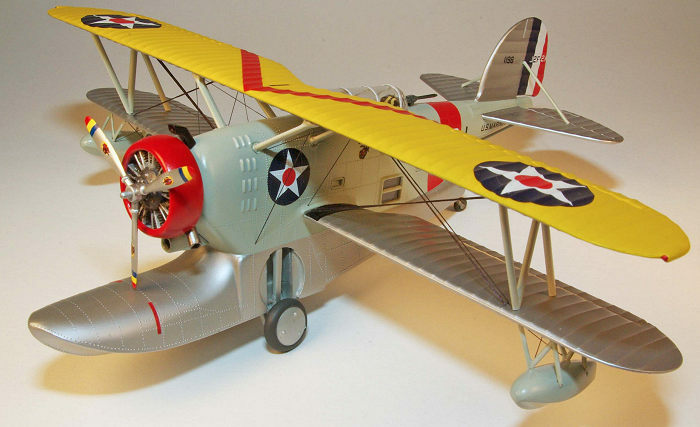 When Leroy Grumman formed the Grumman Aircraft Engineering Company in 1929 the business relied on repairing and rebuilding aircraft as well as developed a series of floats with retractable landing gear. Proposed to the U.S. Navy in 1931 as a amphibian utility aircraft, the XJF-1 Duck prototype was ordered in 1932. After evaluation and redesign the JF-1 was accepted for production in small numbers as a utility aircraft to support fleet aircraft carriers. The next version was the JF-2 contracted by the U.S. Coast Guard for search, rescue and patrol duties and delivery began in 1934. In 1936 further improvement resulted in the J2F-1 Duck that featured a lengthened main float to improve water performance and equipment for target towing, smoke generation, photography, and medical evacuation. Twenty-eight were delivered to the Navy. These aircraft were followed by the J2F-2 model featuring a more powerful 790 hp Pratt and Whitney R-1820-30 engine; thirty were delivered to the U.S. Navy and the U.S. Marines. Of the Marine aircraft nine were modified as J2F-2As in 1939 to equip Marine Scouting Squadron 3 (VMS-3) for Neutrality Patrol duty in the Caribbean. Further product improvements resulted in the J2F-3, J2F-4, J2F-5 and finally the J2F-6. Due to war time combat aircraft production priority for Grumman, Duck production was sub-contracted to Columbia Aircraft Corporation in 1941. The J2F-6 was the most numerous version manufactured with 330 being built and the last delivered by the Columbia Aircraft Corporation in 1945. Through out its career the Duck served in a general utility and light transport duties but also performed missions including mapping, scout/observation, anti-submarine patrol, air-sea rescue, photographic survey, reconnaissance and target tug duty with small numbers of aircraft assigned to various squadrons in the US Navy, the US Marine Corps, the US Coast Guard, the US Air Force and several foreign navies. It is probably most recognized for its use in the 1971 movie “Murphy’s War” that featured a J2F-6 Duck flown by Murphy in his obsession to destroy the Kriegsmarine submarine that sank his ship. Several examples survive today in the United States. Initially released in 1958 by ITC Model Craft, Glencoe Models re-released the kit as J2F-2 Duck, kit number 04101, in 1988, in 2006 as kit number 4101 and currently as kit number 5125. Although listed as “Approximately 1/48th scale” the model is actually 1/52nd scale per the kit instruction sheet. Molding in light gray plastic consisting of fifty-six parts with a single piece clear canopy, the quality of the kit is great for 1958 technology (I’m old enough to know the difference!) but when measured by the best of today’s technology will shock the modeling senses. The fuselage has prominent rivets and basic details are soft or even completely incorrect. The cockpit interior consists of a floor and two seats that resemble bucket seats from my 1969 Volkswagen Beetle. Two half figures are pr ovided as crew and they are much too large for the scale. I have no idea if the overall dimensions are correct but comparison to photos of a J2F-2 show additional missing features such as the air intakes above and below the engine cowling, a simplified and inauthentic landing gear and rear tail wheel, and no interior under the cockpit. Under wing rocket launchers and integrally molded in rockets are also included although these were never used on any Duck. Later versions did have the capability for under wing racks able to carry bombs and even 325 pound depth charges but these are not provided. The included Scale-Master decals provide markings for three aircraft; a U.S. Marine Corp VMS-3 Duck based in the United States Virgin Islands, a U.S. Navy plane of Utility Squadron 1 based at Pearl Harbor, Territory of Hawaii, and an Argentine Navy aircraft. The instructions for assembly are very basic although the markings and decal placement diagrams are clear. Probably like many modelers dealing with alignment of a second wing and rigging has always seemed daunting. In fact I had never before build a biplane model with this and a few other biplane kits languishing for years in my collection. Having jumped on the Airfix wagon by purchasing the company’s excellent new Supermarine Walrus it seemed like a good idea to finally develop a technique to meet the alignment and rigging challenges before taking a project with more financial and emotional investment. What better way than to retrieve an old, low value kit from the collection and try things out. Relying on Steve Ginter’s excellent Naval Fighters Number Eighty-four Grumman JF/J2F Duck for reference it became clear that built truly out of the box the model really would result in a flash back to the 1950’s era of modeling so I decided to make some changes to make the finished model look a little more in tune with today but still limit the time investment. After washing the parts in warm water and dishwashing detergent to remove any mold release agents some test fitting was done to assist in construction planning. The kit seats were discarded in favor of a 1/48 resin and donor kit seats from the spares box; one was a Squadron True Details P-47 seat and the other came from an unknown 1/48th kit. Although not accurate for any Duck they look far better than the kit seats once painted, highlight washed and installed with a closed canopy model. I thought about adding two 1/48th scale crew members but there was no way to make any of my saved spare pilots fit in the small space with the replacement seats. There is no hull interior below the cockpit floor despite the clear windows but I decided to leave that area alone. To prevent a direct view into the hull/fuselage through the wheel wells they were blanked off using pieces of 0.020 sheet styrene trimmed to fit and cemented in place with liquid cement. The entire fuselage interior was airbrush painted Testors Model Master Aluminum as was the cockpit floor. Based on black and white photos of pre-war Ducks it appears the interior was either natural metal or painted aluminum color except for the instrument panels. The inaccurate and basic pilot’s control panel was painted flat black with silver dials. Since no control st ick is included in the kit one was fabricated out of carved stretched sprue, painted Testors Silver, and installed. The hull windows were attached from the inside using Tamiya Extra Thin liquid cement (a superb fast setting liquid plastic solvent cement) and the fit is good and secure. The landing gear needs to be installed before the fuselage halves are joined and are designed to raise and lower although when raised the fit, with wheels attached, leaves much to be desired. The legs and links bear little resemblance to the real aircraft but I decided not to make any changes. The legs were airbrushed with Testors MM Aluminum and then assembled per the kit instructions. The fuselage halves assembled well using liquid cement after attaching the cockpit floor. Fit was good and only a minute amount of Bondo red auto body putty thinned with lacquer thinner and a small amount of Testors liquid cement was needed on a couple of areas of the seam line. (Incidentally in my experience thinning the Bondo with lacquer thinner alone does not provide enough adhesion to bare styrene plastic but this seems to be corrected by adding about 10% Testors liquid cement to the mix. However, one must be careful to avoid over application due to the risk of dissolving plastic.) Sanding the seam naturally removed some of the rivet detail so after the filling and sanding was completed the rivet detail was restored using the R&B Productions Rivet-R Mini tool (#RB-T010) that was being used for the first time. The R&B tool is very nice and comes with four different wheels with varying rivet spacing that is clamped into a common hobby knife holder (not included). The entire engraving wheel is visible while it is being used so very precise placement of the engraving is possible with care. One wheel matched the original kit rivet spacing exactly and the engraved rivets look quite good when the surface is painted. Once the fuselage was complete the next step was the wings. Both lower wing halves and the top wing halves were assembled using liquid cement. The lower wings surface has four holes per side to receive the rocket launchers that I did not intend to use so the holes were filled with stretched sprue and Bondo putty and sanded smooth. After finish sanding of the peripheral join seam the bottom wings were ready for attachment to the fuselage. On a biplane accurate and symmetrical attachment is essential since the top wing must align with the bottom. On the Duck the bottom wing has 3 degrees of dihedral while the top wing has 0 degrees of dihedral. Although the wing tab is slightly angled to provide the dihedral the corresponding fuselage slot fit is much too loose to rely upon a accurate assembly. To solve the problem and later assist in the top wing assembly a jig was made using inexpensive Styrofoam construction board readily available at any office supply, craft store or Walmart store. Styrofoam construction board consists of two heavy, smooth paper sheets laminated to a core sheet of Styrofoam and is precisely 0.25 inches thick. It is very easily and accurately cut with a box cutter with a new, sharp blade against a steel straight edge. The jig components were assembled with the necessary 3 degrees of dihedral on the jig to support the lower wings. Regular white PVA glue was used to assemble the jig and lengths of tooth pick were strategically placed and glued to allow the model parts to be held in place using small rubber bands. The fuselage was aligned in the jig and held in place by the rubber bands and the lower wings were then glued in place with liquid cement. Following this the horizontal stabilizer assembly was cemented in place although a minor amount of trimmin g of the mating surface was needed for accurate alignment. The rudder was then attached. After the assembly was cured the fuselage/wing/stabilizer was removed for masking and painting. It and the upper wing would need to be finish painted before assembly since it would be impossible to accomplish once both wings were assembled. In addition the small components were assembled and painted including the engine, wheels, cowl ring, and struts. The upper air intake above the cowl ring and the lower air intake below the cowl ring were present on the J2F-2 but omitted from the model. The upper intake was carved from a section of left over sprue and the lower intake was made from the parts from the spares box. A small section of 1/64th brass rod was glued with CA into each to provide reinforcement for the attachment to the fuselage. The exhaust ring was used although it is not accurately represented; in the real aircraft the lower part of each exhaust is slightly curved. The ends were drilled out for appearance. Once the finish painting and decal application was done including the satin clear coat the model was replaced in the jig and the interplane struts (the ones toward the wing tips) carefully test fitted to the lower wings and the upper wings. The cabane struts (attaching the upper wing to the fuselage) have attachment pins where they meet the wings while the fuselage end inserts into a slot within an excessively large hole in the upper fuselage. The angle of the fairing on the wing end was too acute for each of the cabane struts so some trimming and filing was performed to improve the fit although it still ended up imperfect. Any resultant gaps were filled with Testors Clear Parts cement then touch up painted with MM Aircraft Gray enamel. The major challenge was coming up and that was the rigging. The Duck rigging was actually termed “tie rods” by Grumman. There are eight long, flattened rods running span wise; four to each side and in addition smaller tie rods between the cabane struts on each side and connecting the upper wing to two points on both the right and left sides of the forward fuselage. In addition there are two tie rods connecting the inner struts for each lower wing float. The span wise tie rods compared to the other tie rods have a flattened cross section that is readily apparent on photos. After doing a fair amount of internet and YouTube research on the many ways to rig a biplane model I decided to use EZ Line and obtained both the fine and the heavy version. The heavy EZ line is flattened so it was the best match to the span wise tie rods whereas the fine would be good for the remainder. I decided to drill blind placement holes in the struts before assembling the wings using a #77 micro bit and pin vise. One has to be careful to match the placement of the holes with the direction of the rigging needed. Also care must be taken to avoid twisting the EZ line representing the span wise tie rods when attached. Once this was done the span wise rigging was glued into the upper wing before the wing was attached to the lower wing. EZ line makes this part simple since it is very elastic. Just cut a piece an inch longer than the final finished distance and glue it by placing a very small and precise drop of liquid CA in the locating hole. Holding the piece of EZ line with a fine tweezers/forceps insert the end into the hole with the CA glue then while holding it in place touch a tiny amount of CA accelerator to the joint with a piece of stretched sprue. The EZ line will be instantly glued in place. This resulted in a total of eight lengths of heavy EZ line being glued to the bottom of the top wing. Once this was done, with the model aligned in the jig, the interplane struts were aligned then glued in place with CA. Once these had cured, the upper wing was inserted onto the upper ends of the interplane struts, alignment verified and held in place using small rubber bands, and these were then glued with CA. After allowing several hours for the CA to set the cabane struts were installed by also gluing with CA. As noted above there are somewhat large holes in the fuselage where the cabane struts insert so after the glue had set these were filled with multiple careful applications of Testors Clear Parts cement. Once filled and dry the cement was over painted by hand with Aircraft Gray. The next step was completing the rigging and this was accomplished by cutting each length of rigging about 1 cm short of the final length then stretching it to the correct hole with the CA glue applied. Once the CA accelerator is touched to the join the line is glued ins tantly. The process is tedious and for me requires magnifying loupes to accomplish but really is not very difficult. Much of this was accomplished with the model held in the jig which simplified handling although some of the rigging was done with the model resting on the egg crate foam pads that I always use to greatly simplify the handling during construction at all phases. After the rigging was finished the rigging insertion points were touch up airbrushed with Testors Dullcote/Glosscote 25%/75% to eliminate the shine of the CA glue residue. Final assembly then proceeded with adding the intakes, engine, outrigger floats and their struts and rigging and other small parts. Attachment of the propeller was reworked to more closely match photographs since the kit plastic shaft provided looks atrocious. The kit canopy was used and was pre-treated with a dip in Future. The framing was hand painted with a 5-0 brush using Vallejo Acrylic paint. 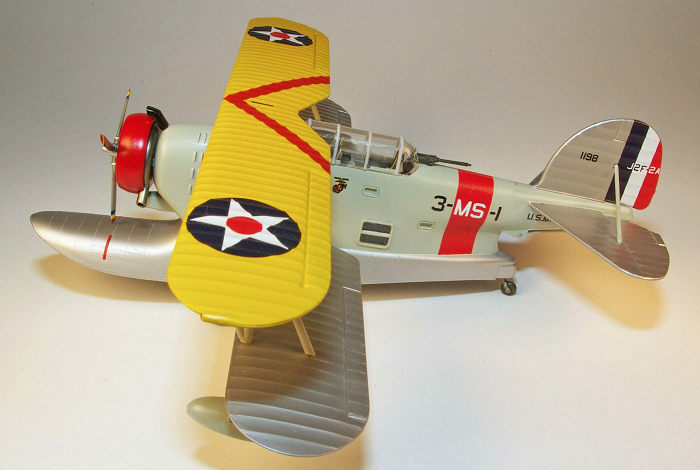 The interwar years includes that time in which many U.S. Navy aircraft were painted in colorful schemes commonly called the “Golden Wings” era. Most of the published photos from the 1930s are black and white and books are available discussing in detail the lack of uniformity in finish application associated with a very thrifty Navy working with a very meager budget. 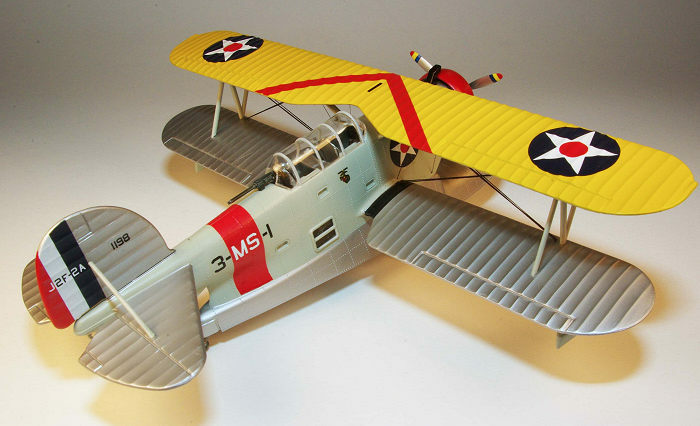 The kit paint and decal instructions for the VMS-3 Duck called for the commonly used finish of Chrome Yellow for the upper wing and Aluminum for all other fabric surfaces with Aircraft Gray for the metal surfaces. Searching the internet revealed a color photograph attributed to National Geographic of VMS-3 aircraft in 1940 at St. Thomas, VI, that shows the fuselage float appeared to be painted Aluminum or perhaps unpainted and that the Chrome Yellow did not extend below the leading edge of the top wing to the lower wing leading edge. The decals provided are for the number one aircraft in a section of three therefore the entire cowl ring is painted; the other two aircraft in a section would have the same color painted on either the top or bottom half of the cowl ring. The major discrepancy in the decal provided is the red stripe on the fuselage. The pictures available in the Ginter’s book of VMS-3 aircraft do not show the band even though there is a picture of aircraft 3-MS-1. I decided to use the decal provided since there was no easy alternative. The fuselage windows were masked and then it was airbrushed sparingly with Rustoleum gloss black enamel pre-shading followed by Testors Model Master Aircraft Gray (FS16473). After several days of drying the fuselage was masked and the float section, rudder, and stabilizer was airbrushed with Testors Model Master Aluminum as was the entire bottom wing and the undersurface of the top wing. After masking the undersurface the top of the top wing was airbrushed with Testors RLM 04 Gelb that is a close match to Chrome Yellow (FS13538). After several days of drying all surfaces were airbrushed with Testors Glosscote to provide a base for the decals. This was my first experience using Scale Master decals and they seem to have the milky white adhesive typically found in late 1980s and 1990s era Monogram decals. Although thicker than Superscale decals they went down pretty well even despite the raised rivets and rib contour when treated with Wathers Solvaset although several applications were needed along with carefully placed pin punctures to resolve bubbled are as and minor slitting with a sharp scalpel to allow conformance to contours. In my experience the Scale Master and Monogram decals work well enough provided 1) warm water is used to wet the decals and then wash away most of the white adhesive, 2) the surface receiving the decal is a variant of silver or natural metal finish or white, and 3) a strong decal setting solution is available such as Wather’s Solvaset. Without those three conditions the results will be unsatisfactory for most discriminating modelers. Spare black decal film was used for the wing walkways. Some minor decal fine brush applied paint touch up of some decals was needed with matching colors. Once all the decals were applied and adequate drying time allowed a final clear coat of Testors Glosscote/Dullcote mixed 75%/25% was applied to give a slightly satin finish. After final assembly the Aluminum float section of the fuselage was airbrushed with Testors Dullcote thinned 20% with lacquer thinner. No weathering was done for two reasons; first, all the period photos of VMS-3 show immaculately clean aircraft and second, my skill in this area of modeling is atrocious. Once completed the model looks nice and is a colorful contrast in my display case full of camouflaged WW II and modern aircraft. Certainly one needs to understand that this model was created decades ago and the technology of the time does not begin to approach the level of detail and precision possible today. With some care and a little attention to construction and finishing detail, especially with the added rigging, it builds reasonably well and looks nice. Building experience is very helpful especially due to the alignment requirements for the wings and, if desired, the rigging to simulate the tie rods. 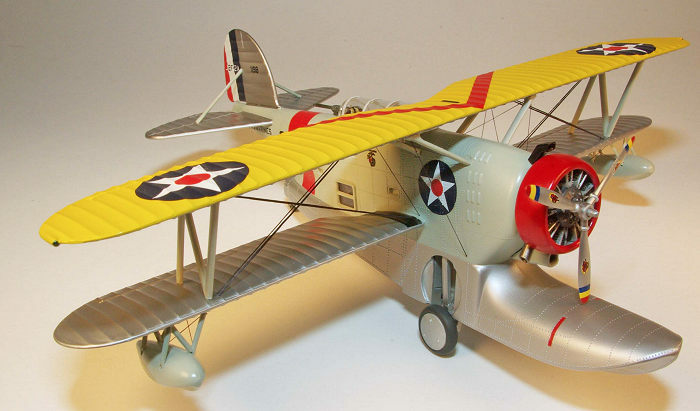 If one omits the rigging the simplicity of the kit makes it very suitable for the beginning modeler who wants to gain experience with assembling a biplane. Just as important it provided an inexpensive way without a great deal of financial or emotional attachment to gain valuable experience in rigging aircraft. My observation is that there are several methods using various materials to complete the task but having used the EZ Line I can attest to its relative ease. The most significant advantage is the self-tensioning provided by the elasticity of the EZ line. Tension and a taut appearance can be difficult to achieve with most other rigid materials like sprue or wire unless a through hole is used to allow the material to be pulled taut. Of course this then requires the hole to be filled, the surface to be finished and then painted adding more work. One product caution regarding the EZ line is that sunlight (ultraviolet radiation) will cause deterioration of the line so sun light exposure is to be avoided. Based on my experience the EZ line seems unaffected by enamel or full strength lacquer thinner. In regards to the J2F series of aircraft, there are two other kit options in 1/48th scale; the 2016 issue Merit International kit #64805 and the out-of-production Classic Airframes J2F-1, 2, 2A, 3, 4 kit #443 and Classic Airframes J2F-5, 6 kit #445 and by most reviews each are good renditions of the Duck although the Classic Airframes kit provides extensive resin and photo etch parts to completely build up the full interior and all visible external details. Both versions are higher priced and in the case of the Classic Airframes versions, more difficult to acquire.